I live in Eastern North Dakota, and have a full time job that doesn’t involve fishing. Although I wish it did!! So I am limited to where I can go for lakes. (Usually a 2 hr radius. is about as far as I will drive) The lakes I go to have mainly perch, walleye, and Pike, and not alot of structure. Flat bottoms, very few rock piles that seem like they get surrounded by the crowds. Where do we go on a lake that doesn’t have all the rock piles, or structure that we are so use to seeing you talk about. The lakes aren’t small, there’s just very little structure. Thank you Joel. And right lines! I think the key to finding locations away from the crowds is to know that even small, rather featureless lakes have some structure. For the ones that are completely void of good breaks, substrate changes, and/or offshore structure, small variations in depth, shoreline features, and bottom content can be a big deal. For walleyes, you’re right, people certainly target the hard turns, points, and offshore defined structure. Secondary spots that most anglers overlook shine in the scenario you speak of. More gradual breaks, long edges with a feeding bench, or even secondary points away from main ones. For perch, those guys roam off-structure, and on a good slough, you should spread out and push away from structure to the mud. That’s where invertebrates will be teeming and the perch won’t be far behind. For both species, spend some time exploring near whatever structure is available, but just off of it. That goes for community holes and hidden gems as well. We’ve gotten good as anglers at finding the obvious spots, and completely miss the rest. I’m just as guilty, and am continually amazed when I find fish stacked in locations I consider poor. They obviously don’t think so! Hope some of this helped, and have a great new years. Thanks for the questions. Ice Fishing Dilemma - Should You Stay, or Should You Go? Even on a good bite, it’s almost always a good bet to do some local roaming around the shelter. I was at the Fargo ice show and attended your seminar. I thought you did a awesome job, and gave great insight as to what it takes as a person, and the gear it takes to be a successful angler. You were limited on time, and you are a busy man so I didn’t want to bother you.... my question for you is this... I’m talking mainly perch and walleye now.... Do we wait it out on the spot we’re at? Or are we better off driving to another lake or slough that doesn’t have all the pressure from other anglers? Hey Jon – my apologies for the late reply, and thanks so much for attending that seminar. I appreciate the kind words and am glad you made it. To leave the lake altogether, that’s a tougher question to answer. Much depends on your lake research, what locals are saying, or more importantly aren’t. In your neck of the woods, I’d rather fish a slough that nobody is on or few people are targeting, than get after a likely diminishing bite on its way down that everyone is hitting. Realize however, that even in the “found” systems where word is out, there’s usually parts of the lake that contain the same fish and people just aren’t finding. Similarly, there’s “unfound” lakes where fish are crushing that no one is at. The rub lies in that even if you check out a lake and don’t find them, they might still be there. For that reason, give likely looking water bodies another chance. Of course, this process takes time, and you need to be willing to not catch fish as much as catch them. For most anglers, that’s the difficult and unacceptable part. In some respects it’s easier to go where you “know” they are, but you’ll never become a better angler and find more fish without constantly searching out new bites. I hope that helps, and good luck out there! Hi David – thanks for the question, and I can appreciate where you’re coming from. In some years, even southern MN doesn’t get the ice that the rest of the state does. That leaves you wondering how far you really need to go in terms of an ice purchase you may only get a few weeks of use from. Still, as I think you’ve identified, it’s great to go with quality equipment that’ll best serve your needs. In your neck of the woods, I think you’d be very happy with either a Marcum M1 or M3. Major differences between them being a bit more power/target-separation and adjustable zoom anywhere in the water column with the M3. The M1 will still have bottom zoom and is a great unit that should not be overlooked! Pound for pound, it does the work of sonar that was cutting edge only a few years ago, and for a fraction of the price. As for the Otters, I’d recommend either the Hideout or the Cottage. The XT Hideout is a stealth option, and both will be nearly full dark with the Cottage being the darkest. It has a complete seal all the way around to prevent light from entering the back edges. Both do not allow light through the canvas, which is a major benefit to the Otter shelters in general. Hope this helps, and good luck out there! Ice Fishing - To Swivel or Not to Swivel? There seems to be an ongoing debate on whether or not a fisherman should use a barrel swivel above a fluorocarbon leader or if one should tie a uni knot. Are there certain times that one should be used over the other? What is your preferred presentation? The long and short of the matter is that I prefer a swivel when I can. Especially for flutter type spoons as they really swing, tumble, and roll around. Your average lead spoons still will impart some line twist, but not nearly that of a flatter spoon design. That said, when the bite is hot and something breaks, I choose time and efficiency over tying in another swivel. I’ve never used a uni-knot to connect on ice, but would do so in the event I needed braid. Whitefishing in deep water would be a prime example of that, but I might take the opportunity to use a swivel there as well, unless my leader needed to be long. Green Bay Walleyes and Whitefish again would come to mind given the clarity of water you’re fishing them in. Hope this makes sense, and hopefully it answered your question. Hey Joel - I was wondering what your preferred method of ice tackle organization is when you are fishing out of a portable? Do you find a tackle bag is the way to go or some other method? I can't seem to find anything that I'm satisfied with when it comes to having what I need easily accessible and transportable. Great question Mike, and it’s a doozy. I think I’ll qualify everything first by saying that I don’t think anyone has found the “perfect” storage solution for all baits, tackle, and accessories. There’s a lot of ways to skin that fish, and what works for some will be horrible for others. In my situation, I’m fishing for constantly changing species in a variety of environments, so I need to have literally everything ready, then be able to pick and choose just a few items as needed to carry on my person and out onto the ice. I’ve got totes, tackle bags, small hard-boxes, line boxes, and a Ziploc bags even come into play. The big totes never hit the ice, and I use what’s in them to stock the tackle storage solutions that make their way out there with me. Looking at it from the surface, it would seem a hodge-podge of whatever I have laying around and thrown into the back of the truck. That said, these solutions have evolved over time to serve all kinds of needs from fun family trips, to filming forays, and everything in between. Line Box – I’ve got a Plano 3700 series deep box that’s full of nothing but line. I respool each late fall, then re-order to fill. Lure Tote – This is a smaller tote that has nothing but lures in it. Again, I keep this one at camp, and only use it to replenish lost items or hot baits I might need. It’ll come with on a long trip, but most often it lives in my garage and is used as a buffer inventory from which to fill tackle boxes when needed. When I use up a popular color or lure in the tote, I know it’s time to buy more. Soft Plastics – I keep these in their original baggies and keep like sizes, shapes, and colors in a quart sized Ziploc freezer bag – these are tougher and stand up for a few years. Walleye Tackle – I have select baits, one bag per size, multiple colors per bag in Ziploc quart bags. Jigging Raps in the package are a big part of the selection here, as Jigging Raps are easily damaged on long transport trips. Bobbers, Sinkers, bare hooks and anything else needed to rig a tip-up or dead-line have their own mini tackle box that lives in the soft goods back. Box 1 – Rippin Raps of various shapes and colors – these hold up well to travel as they’re not as heavy. Box 2 – Slab Raps and UL Rippin Raps. Box 3 – Spoons of various shapes and sizes – These will get beat up, you’ll lose chips and chunks of paint, and you’ll have to be OK with it. These are high use, constantly replenished items. Box 4 – Swiss Army Box – Jigging Raps are the number one bait that gets damaged while in transport, but I do have a few out of the package and ready to rock in this box. Oddballs also go in here, along with extra baits the didn’t fit in the first three boxes! Small Utility Box – Panfish – I’ve got one side of this filled with vertical panfish jigs, the other side, a mix of horizontal lead and tungsten baits. Medium Utility Box – Walleyes/Perch/Crappies – This box has some plastics and bare hooks in the clear plastic flip lids, along with spoons in the memory foam. I do have a few Teardrop jigs in the clips, but this is a minimalist walleye box that has the very best of the best only inside. Like I said, it’s far from perfect, but it works great for how I fish. Every year I refine it and get a bit better! Joel – I met you in Blaine at the show. 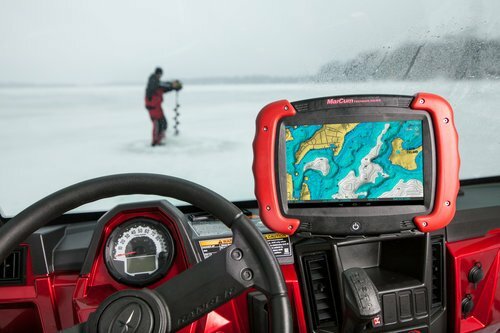 I know I want a Marcum for winter fishing, which is best? While I’m guessing you didn’t mean to open a can of worms here, you did, but it’s a good thing! I’ve been meaning to do this for some time. On Facebook groups and at all of the shows I’ve attended in person this year, “Which Marcum Should I Buy” could be the most common question I’ve seen and heard. The answer is easy of course - it depends - on a number of factors, but we can do better than that. 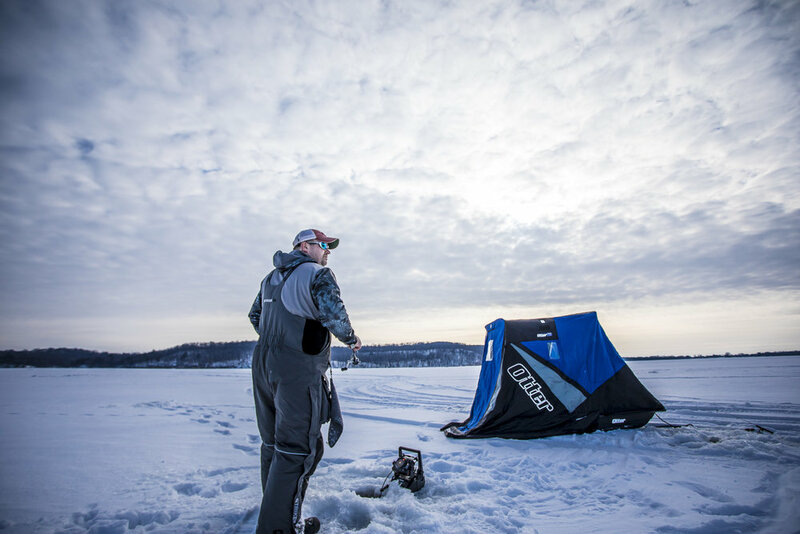 The Hole Hopper – Personally, this is my style of fishing, but I’m not always punching holes and running around the ice. When I am, mobility and ease of use is key. I want something without a ton of settings, that has a great range of features but won’t get in my way or be difficult to tune in with gloved hands. The Marcum M5 on a Lithium Shuttle is the hole-hopper supreme. The M5 has adjustable zoom anywhere in the water column, which I set for the depth I’m fishing, and forget. It’s compact head and lightweight lithium ion frame make it the most sleek and quick fishing unit I own. If popping and dropping is all you do, the Lithium M5 is your unit. I will concede the the Lithium LX6 is another great option, especially if you’re married to the LCD display. Inside and Outside Both– So often I’m going back and forth between a wheelhouse and/or portable, and the open ice. I want something that serves both needs without leaving me wishing I had more features and options once I’m inside, warm, and gloveless. That’s where the LCD display on the LX7 is really nice. Adjustable brightness display is great for later evenings, and the screen size on a 7 is phenomenal. I’m able to customize my screen left to right from scrolling graph, circular dial mode, and the bottom zoom. I watch the main dial for fish 75% of the time, occasionally glancing at the historical scrolling graph to make sure I didn’t glance away and miss them on the main dial. Most of the rest of the time, I’m watching fish close on the vertical zoom bar on the far right. It offers the most resolution and best odds of playing your cards right for spooky panfish or fickle ‘eyes. To Lithium or not, that is the question. If you do a bunch of hole hopping and a little bit of sitting, opt for the Lithum LX7. If you’re primarily sitting and only doing a bit of hole hopping, save some cash, get the LX-7 in the soft pack, and you can always add a lithium battery to it later. All the Nuts and Bolts – If you want a do-everything unit, the best option is an RT-9. While the price point may have scared folks away at first, prices are coming down and the physical feature set of these are pretty incredible. GPS, sonar (multiple ducers if interested), and camera can be mounted to the back of these to serve as a wheelhouse command center. Integrated GPS mapping, enhanced with an optional Navionics card, allows you to RAM mount one of these to the dash of your truck, or the wall of your wheelhouse. Nothing else on the market will do what this unit can, and though it’s a niche product, pricing decreases have made it much more competitive a unit in the space. Back to the Basics – If you’re satisfied with a circular display unit in a softpack, and want to protect the budget a bit – the M5 and M3 are incredible units. I think it’s important to remember that as recently as a few years ago, these were the pinnacle of sonar performance, target separation, and fish finding capability. Not to mention, they’re of the few ice electronics packages these days that still are offered in a softpack, which is an important consideration to many folks. Choose the M3 if you fish primarily featureless soft bottom lakes and don’t fish near many people, and the M5 with it’s switchable ducer for $100 more if you’re always fishing sharp breaks or tight to a buddy. Switching to the narrow cone will alleviate sonar shadow on steep drop-offs, and unit interference from nearby ice electronics. Of course, if you could always get these offerings in a Lithium Combo, as both the M3 Lithium Combo and the M5 Lithium Combo feature the Lithium Shuttle (also sold separately) with extended run-time, incredible lightweight, and a host of other features. This category is the biggest, and really allows the consumer the most flexibility. Entry Level, Youth, and Back-up– For just over $300, you can get a Marcum entry-level unit that exceeds the limits of all competitor starter setups. The M1 has bottom zoom, a softpack, and best in price class 2” target separation, meaning you don’t have to feel like you’re sacrificing quality to back off of price. I own a few of these, and they’re simple to operate, which means they’re great for my kids or first time anglers. Also, don’t feel bad if this is the unit you prefer! The previous iteration of this unit was the VX-1, and I used it to really clean up on Red Lake walleyes back in the day. I appreciate features in more advanced units, but I also don’t feel handicapped having one of these along for the ride. I always tell people that when it comes to ice electronics, especially these days, it’s hard to go wrong. Consider them an investment in your fish catching and fun, and an investment that’s easily recouped. Provided you buy them right, worst-case scenario, you’re selling a 1-year old unit on the used market during peak season the following year, and you lose $100. That’s the cheapest 1-year Marcum rental you’ll find anywhere, and is testament to the fact that these things hold their value. Especially the basic versions. So be honest in evaluating yourself and how you fish, then take these recommendations to heart. I’ve fished with literally dozens and dozens of models of Marcums over the years, and this advice comes with myself, friends, family, and fellow ice-anglers in mind. How Many Holes Before Changing Blades? On average, how many holes do you drill before you change or sharpen the blades on your power augers? Kenneth! – thanks for the question. I wish I could tell you that there was an “average” but to be honest, they’re always fine until they’re not. Chipper blades are much more rugged, but cut more slowly. I use shaver blades exclusively for their speed and overall effectiveness at cutting. While there are times I’ll replace them every 1-2 years just because I feel I can get more speed from new and sharp ones, most of the time I’m switching blades because of some unforeseen issue. That can be sand or blown topsoil that formed with the ice, and most often on high-traffic lakes where a truck sat, dripping salt, sand, and grime right where fresh snow covered it up and I end up drilling through. All kinds of crazy things can happen. I’ve hit shallow rocks/sand, and have even overtightened and broken the set screws that hold blades on. Point being, it’s best to have replacement blades (AND THE TOOLS TO CHANGE THEM) out on the ice with you. If it hasn’t happened yet, someday it will, and who knows where you’ll be and whether or not blades in your size/brand will be handy. Here’s a link to the replacement shaver blades I use. Chipper replacement blades here. Consider it cheap insurance especially if you travel any distance to fish any destination lakes.